Ozone Sauna Therapy is a method in which ozone is introduced into the body via the skin while sitting in a humid therapeutic cabinet or pod. While the client is comfortably resting in the pod, O3 is absorbed into the dermis which improves the cellular makeup of the individual allowing detoxification and elimination of toxins to take place. As the pores of the skin open, as a result of being surrounded by the warm steam, ozone enters the body transdermally (i.e., via the skin). The ozone then penetrates the blood, lymph, and fat. By allowing ozone in and toxins out through the sweating process that is induced by the thermal heat, the benefits of Ozone-Sauna Therapy take place. Transdermal ozone therapy is one of the most powerful methods of detoxifying and oxygenating the body in existence. Sauna Therapy increases the elimination, detoxification, and cleansing of the dermis by stimulating the sweat glands while improving blood flow/circulation and toning healthy skin. Hyperthermia itself is a very effective technique, many thousands of years old. It results in a “false fever” reaction, which simulates the body’s defense mechanism. With the addition of ozone, the treatment becomes doubly powerful. As the toxins are oxidized and eliminated from the body, the fat containing them is no longer needed and also leaves. 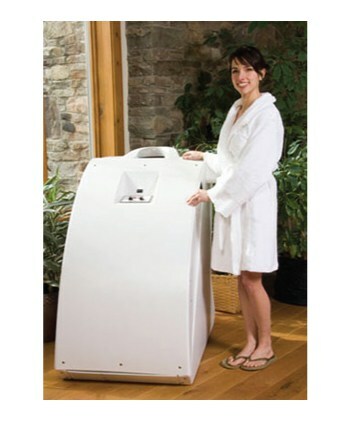 This is backed up by the consistent accounts of weight loss associated with ozone sauna therapy. As well, the tendency is for the skin to become smooth, soft and free of blemishes. Symptoms of a whole host of diseases disappear as the toxins leave the system. 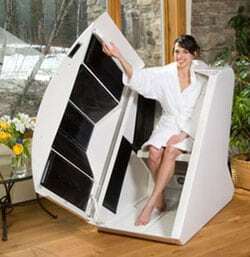 When ozone is introduced to sauna therapy the health benefits increase astronomically. The humid heat created by the sauna opens the dermis pores allowing the ozone to impede the blood-brain barrier, which travels to the lymph and fatty tissues. Cleaning the lymph tissue of toxins is paramount to expedite health; Ozone Sauna Therapy is the safest and most economical process to accomplish this. Allergies/Athletes Foot/Autoimmune Disease/Builds Muscle/Burns Fat/Cancer/Candida/Chronic Fatigue Syndrome/Colitis and Crohn’s/Corrects Memory Loss/Decreases Stress/Diabetic Ulcers/Fibromyalgia/Fungi, Molds, Bacteria and Yeast/Herpes Simplex/Joint Irregularity/Lyme Disease/Sinus Conditions/Vaginal Infection/Vitality Booster/And many more conditions. Typical treatments are between 20-40 minutes in duration. People with heart conditions or stroke should limit the duration to between 5-15 minutes for the first few sessions, increasing to 10, 15, 20, 25 and then 30 minutes, as the body adjusts to the thermal stress.